If you're the guy who thinks of the vastness of the universe and begins to sweat, then turn away now. If you are the guy who takes comfort out of the insignificance of humanity, here's a spreadsheet you'll always find handy if you can not fall asleep and need something to make you sleep. A PNAS study published last week attempted to conduct a biomass census of the entire Earth. It turned out that all life was about 550 gigatons of carbon (Gt C), and basically it's just plants. The study divided the life forms of the planet into rather rough categories. Some are at the level of the kingdom (animals, mushrooms, archaea, etc. ), while others are more finely toothed (such as marine invertebrates and livestock). They also contain viruses that do not really live, but behave like living things. 2 GT C, archaea (a type of unicellular organism) are 7 GT C, and protists (a group that contains algae) are 4 GT C.
What about humans? Well, all animals – land, sea and air; Vertebrate and non-makeup 2 GT C. People are a measly 0.06 GT C, less than roundworms, mollusks and just about everything else alive. 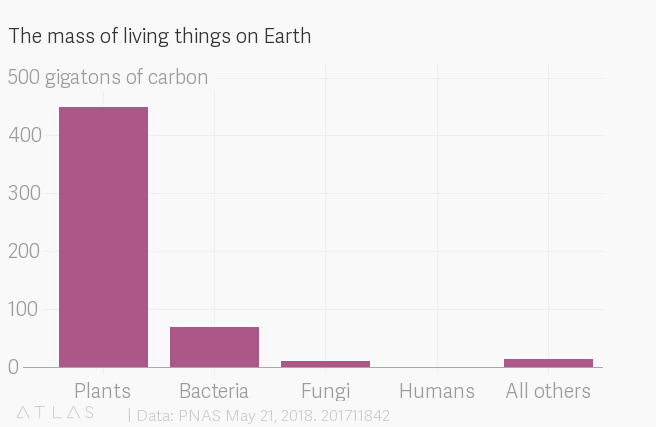 Another way to see it: Humans account for only 0.01% of the carbon weight on Earth. You may ask, "why carbon?" After all, it's not what someone uses to weigh things in the real world. The authors of the study say that they have thought through other options, but they went with the carbon mass, because it is independent of the water content (ie less variable) and on the other, which has used the literature in the past for the most part. Researchers digged this literature to find biomass samples from various locations around the world representing all kinds of environments. Then they found out the global distribution of these different environments and made an estimate for the entire planet Earth. Well, that's of course inaccurate. But it offers a powerful perspective on our position on the planet. Another result of this study, worthy of further consideration, is that livestock biomass far exceeds that of wild mammals; The same applies to domesticated vs. wild birds. In fact, when you combine humans and livestock, it becomes a group that outweighs all other non-fish vertebrates together. In other words, we only make up a tiny part of life on earth, but we go far beyond our weight. And not in a good way.